I had to write a recension for uni of a book about mediative communication. Being myself, I left it to the last minute (I have to hand it in tonight at 19.50). I finished reading the book and the summary yesterday and just wrote the last sentences of my personal comments on it. Although it has 11 pages instead of ten and it’s 7 pages summary and 4 pages statement instead of 5-5, I am hugely relieved and done. They’ll go nuts, and eat their hats, well, what do you think of that? Anyway, back to the topic. The plot was predictable and not really innovative, but who cares when it’s so nice to watch it anyway. The good guys except for the main characters were all black, a must-have in modern, PC films, which doesn’t bother me, just an observation. Robin Williams brought us one of his best performances ever (why, oh why did he do License to Wed? And why, oh why did I watch it? ), and seemed to have fun doing it. So, altogether it was mindless, it was good entertainment but as romantic films go there are better out there. Adrienne Shelly was not only a good director (I especially liked the scenes where Keri Russell aka Jenna always has the same facial expression during five or so different takes), she also was a very good writer. The dialogues are beautiful, funny and witty. Do I need to say more than: “I was addicted to saying things and having them matter to someone.”? There are some actors I like and am always kind of glad to see, although they mostly chose crappy movies and/or roles to play and this movie had two of them: Jeremy Sisto (ever since Clueless) and Nathan Fillion (ever since Buffy). It was nice to see them doing a good film for a change. P.S. I Love You is one of the rare cases where the film is actually better than the book. There’s no depth to the characters and it’s badly written (maybe I have to blame the translation for that, I did read it in German). Where the movie made me cry about 5 times (if not more often), the book didn’t at all. The changes that were made for the film were mostly for the better (except that it plays in New York and the thing with the shoes. Though those weren’t necessarily changes for the worse). I didn’t expect much of it in a literary sense anyway, but I thought it would be more touching, one of those mindless-but-beautiful romances. It wasn’t. The beautiful part was mostly missing. So, I recommend everyone to watch the movie and stay away from the book. Altough it is a pretty quick read (took me two days). I never was very interested in the blog statistics but sometimes I have a look. Fascinatingly enough, yesterday was the day I had the most hits ever (73), and I think it’s because of the Heath Ledger entry. Continually, what attracts most of the attention though is some old entry I wrote about German voices for American actors. I do understand why my page shows up with almost all of the terms (except the haircut stuff – I don’t think I’ve ever used the word anywhere…) what puzzles me, though is how people end up on my page as it’s surely something like result number 399.456 (of 399.458). I just tested it – typing “synchronstimme michael madsen” into google: I’m actually result number one… I’m impressed with myself right now. I just finished Life of Pi by Yann Martel. And it was a wonder I did. When I first started reading it, I couldn’t stand his (to me) smug and condescending tone about the story and how it’s so wonderful and how he’s found the perfect way to handle religion (and by the way, I don’t consider myself an expert in this field, but I don’t know any Christian religion that would say you don’t need to get baptised, you’re Christian anyway). I kept on going anyway because my sister (who lent me the book) liked it a lot and she usually has a good taste and although my mother started to read it but gave up because she thought it boring. After about a quarter of the book I seriously considered closing it and never opening it again (anyone who doesn’t know me: that’s a huge decision for me. I even read all of Javier Marias‘ A Heart So White although I knew the “twist” of the story after 20 pages, and it was repetitive and boring as hell…). As I couldn’t decide, I kept on reading and today I finished. It’s not a bad book, there’s definitely worse out there. But it’s too long, Martel gets lost in boring details. I liked chapter 99 (although he obviously doesn’t expect his readers to read the book up till then as he explains everything. Thank you, Mr Martel, but I do like to think on my own. ), I could have lived without chapter 100 (the last one). He had a good idea but that’s about it. It seems like there was some serious editing missing, maybe (as is increasingly common with publishers, unfortunately) he didn’t have an external editor. Anyway, I wouldn’t recommend it, my sister would, my mother wouldn’t, K. wouldn’t, another friend would, my mother’s best friend would… I guess it depends on how interested you are in life in a lifeboat with botanical and zoological digressions. If not too interested, let somebody tell you the story. Wikipedia tells us that Jean-Pierre Jeunet is supposed to make the movie. I don’t think he would be the right person to do it. Or if there should be a movie at all (although I think that it would work better as a movie than as a book). But the info seems old and imdb doesn’t know anything about it. After posting about Heath Ledger, it seems a little weird going on with business as usual. On the other hand, it’s also weird to be that affected by some person’s death just because I have seen him in some movies. I never talked to him, never met him, never wrote him a mail. Be that as it may, I am affected, I do feel sad and sorry. Despite that, I will post this link anyway and hopefully, it will make you laugh as it made me laugh. I just heard about Heath Ledger‘s death (via psyriac.com) and honestly, I am shocked. He was so young, only 28. It’s unfair that he died so young and I hope that his family and especially his daughter have enough support and are a support for each other. 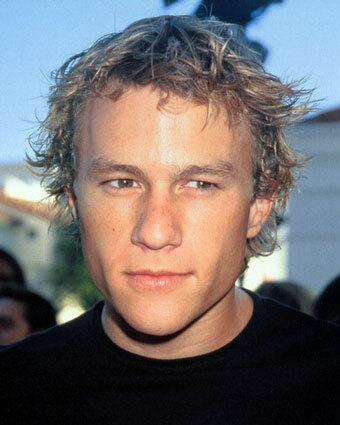 I never was a Heath Ledger Fan Girl, but I always enjoyed his movies and his acting. I’m sure that, given more time, he would have achieved great things and I’m sad that he won’t have the possibility now. I am glad that he did the movies he did and I hope he enjoyed his life, short as it was. I hope he really did.